MineraLic Hi-Phos supplement is specially formulated to enrich the diet of cattle without the added cost of supplemental protein. This unique supplement is second to none when compared to other low-moisture blocks. This block is the product of a state-of-the-art patented process that provides a unique 24-hour feeding system. MineraLic Hi-Phos is an exceptionally dense block that will give you the most for your money. Economical: A low feeding rate of 1/4 lb/head daily means lower feeding costs (on a per head per day basis). High Mineral Fortification: This supplement is highly mineral and vitamin fortified which means that additional minerals do not need to be added to the diet, resulting in significant cost savings. Weather Resistant: The patented, “continuous flow” system creates a low-moisture, exceptionally dense block that maintains its integrity even in wind, rain, or hot, humid weather or precipitation which minimizes waste or loss of product. Minimal Labor: MegaLic® MineraLic Hi-Phos is easy to feed. Simply place the block in areas of easy access to cattle. 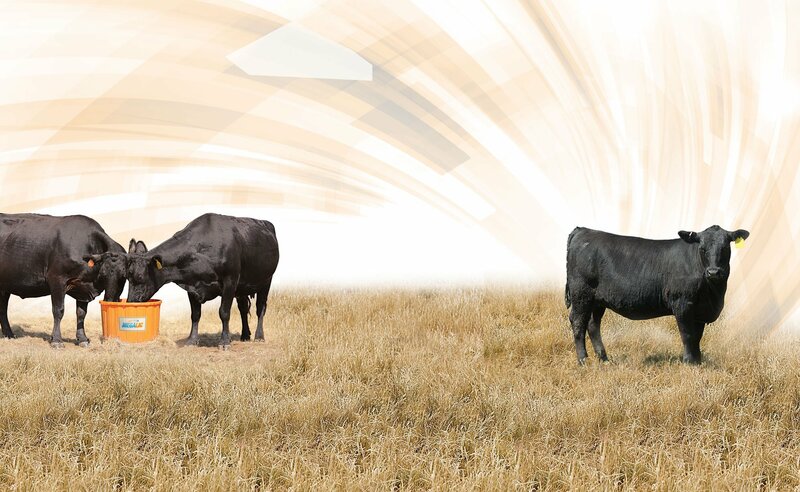 MineraLic Hi-Phos offers the benefit of a high level of mineral in a palatable supplement that cattle will consume consistently. This supplement contains a minimum of 8% calcium and phosphorus. MineraLic Hi-Phos contains no supplemental protein and is recommended for supplementing spring and summer pastures when supplemental protein is not required. Phosphorus is important for proper bone development in the beef cow and is the major mineral of the energy compound ATP, which is the molecule that provides energy to the cells. Most range forages are low in phosphorus and high in calcium. Symptoms of a phosphorus deficiency are fragile bones, poor growth, depraved appetite, chewing of wood, hair and bones, poor reproductive performance and reduced milk production. Copper is required for reproductive performance. A significant symptom of copper deficiency includes delayed or suppressed estrus, along with reduced growth rate, fragile bones and anemia. Manganese is a necessary element of bone growth and skeletal development, as well as reproduction. Skeletal abnormalities such as weak bones and stiff joints are signs of deficiency, as well as poor reproductive performance and reduced conception rates in older cattle. Zinc is essential in the function of numerous enzymes. It is also needed for normal development and functioning of the immune system. Research has also shown that zinc is a requirement of the reproductive system. Stiff joints, skin lesions, reduced testicular growth, delayed puberty and abnormal estrus may be signs of a zinc deficiency. Selenium is necessary for tissue repair, normal function of the immune system, and reproductive performance. Selenium is interactive with vitamin E, and a diet low in vitamin E may require an increase in selenium supplementation. A common symptom of deficiency is white muscle disease in young cattle characterized by lameness, stiffness, or cardiac failure. Vitamin A is required for growth, reproduction and maintenance; vitamin D affects calcium and phosphorus utilization and vitamin E helps to increase immune system function as well as interaction with the functions of selenium. Vitamin E plays a vital role in the prevention of mastitis. Provide free choice as a supplement to pasture cattle at the rate of one block for each 10 to 20 head. Place blocks in each pasture near areas frequented by cattle, such as watering locations, shade or loafing areas. Cattle normally consume approximately 4 ounces per head daily. Consumption may vary depending on climate, grazing conditions, condition of cattle and/or availability of other feeds. In situations where climate and/or other factors result in consumption less than 4 ounces per head daily, MineraLic Hi-Phos consumption may be increased slightly by providing additional blocks in each pasture.